I'm delighted to welcome old friend Julia Meister to the salon once more, as your guide to Buda Castle! For any Habsburg devotee, visiting Budapest for the first time is a unique and spellbinding experience: The twin capital of the dual Austro-Hungarian monarchy is full of sights that must not be missed, cafés which were once frequented by Emperors, queens and princes, as well as one of the most spectacularly located Castle you’ll ever set eyes on. I’m talking, of course, about Buda Castle, situated on the south tip of Budapest’s Castle Hill. It is surrounded by several historical – medieval, Baroque, as well as Modernist – buildings. Paying a visit to Buda Castle also means being transported back in time due to one being surrounded by the 19thCentury atmosphere of the Castle District as a whole. 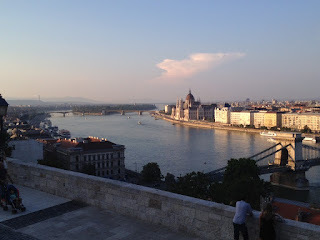 However, first things first – the view of Buda Castle from afar never fails to take my breath away. Whether you’re strolling along the beautiful blue Danube, or are already sitting on the tiny bus* which is about to take you up the curvy serpentines of Buda Hill: Trust me, it is quite the experience! As you cross the Chain Bridge with its famous lions, which bear the name of the Emperor himself (I. Ferencz Josef in Hungarian), you feel as if you are being welcomed to a place where the Austro-Hungarian monarchy actually still exists. After the Austro-Hungarian Compromise of 1867 – which, to a degree, liberated the Kingdom of Hungary from Austrian rule (foreign policy was still decided upon together) and re-introduced the historic constitution of the Kingdom of Hungary – , Buda Castle was being rebuilt from 1875 to 1912. With Elisabeth (Erzsébet) and Franz Joseph having been crowned as King and Queen of Hungary on 8 June 1867 in the adjoining Mathias Church, the Hungarians were obviously keen to provide their rulers with a splendid palace! Not much had been done to modernise the inside of the Castle since the 18thCentury. Hungary had been rebelling against Austrian rule since 1848 (although, to be fair, they had always been trying to break free from the Habsburgs). Thanks to Empress Elisabeth’s love of Hungary – she was fluent in the language, loved the Hungarian countryside, and had Hungarian ladies-in-waiting –, Franz Joseph had no other chance but to bow to his wife’s will and declare Gyula Andrassy, Elisabeth’s good friend, Prime Minister. Under his rule, Hungary went from strength to strength, and the Hungarians showed their gratitude by worshipping their Queen like a goddess. (A tradition which has continued until the present day!). Elisabeth thanked them in return by spending more time in Hungary than in Austria. You can imagine that the Viennese court did not approve of such behavior – oh, how Elisabeth loved to rebel! While in Hungary, Erzsébet mostly favoured the Royal Palace of Gödöllö, where, due to it being located an hour away from the hustle and bustle of Budapest, she enjoyed much more privacy. However, when Elisabeth found out that she was pregnant again with her fourth child (her youngest daughter, Sophie, had died at a young age), I can only imagine that she decided to give birth at Buda Castle as a display of gratitude to her favourite nation on Earth! The child, Marie Valerie, was to be her favourite, and rumor had it that not the Emperor himself, but Erzsébets dear companion had fathered her…Historians do agree that this rumor is completely unfounded. Interestingly, Marie Valerie was called The Hungarian Child, since her conception coincided with the Hungarian coronation. Elisabeth and Franz Joseph had apparently not been sharing a bed up until that event. Erzsébet agreed to resume intimate relations (at least for a short while) as a reward for Franz Joseph’s cooperation. Another interesting fact: Marie Valerie was only allowed to converse in Hungarian for the first few years of her life. This made things a bit complicated when she eventually returned to Vienna, since the German language was not exactly her forte! Packed with all this background information, you may ask yourself whether it is possible to not only admire the Castle from afar, but to set foot inside it? But of course: The Budapest History Museum (http://www.btm.hu/eng/) is highly recommended! It features a permanent exhibition called The Royal Palace – The Castle of Culture, which allows the visitor to catch a glimpse of the castle’s beautiful furnishings, decorations and paintings. Since most of the interior of the castle was destroyed during the Second World War, it is lovely to see how much time has been put into the reconstruction of some of the castle’s features. By visiting, one may also have a look at the medieval part of the castle, which features a truly remarkable chapel! I highly recommend ending the day by paying a visit to the Monument of Prince Eugene of Savoy. It is situated on the Danube Terrace, from where you can enjoy a panoramic view of the city’s Pest side. Keep your camera ready, as this is a photo opportunity par excellence! Still looking for a further Habsburg fix? If so, a café called Ruszwurm(Szentháromság u. 7) is a must for you. Delicious cakes, coffee specialities and lots of Habsburg memorabilia to look at while you enjoy the cosy 19thCentury atmosphere of the place – what better way to end the day?